Check out this gently-used 2018 Jeep Wrangler JK we recently got in. This Jeep includes: RADIO: 430 AM/FM Stereo Bluetooth Connection Auxiliary Audio Input Hard Disk Drive Media Storage MP3 Player HEAVY DUTY SUSPENSION W/GAS SHOCKS RHINO CLEARCOAT JEEP TRAIL RATED KIT TRANSMISSION: 6-SPEED MANUAL (NSG370) (STD) 6-Speed M/T M/T SIRIUS SATELLITE RADIO Satellite Radio BLACK 3-PIECE HARD TOP Targa Roof Rear Defrost Convertible Hardtop QUICK ORDER PACKAGE 23S SPORT Leather Steering Wheel ENGINE: 3.6L V6 24V VVT (STD) V6 Cylinder Engine Gasoline Fuel BLACK, CLOTH SEATS W/ADJUSTABLE HEAD RESTRAINTS Cloth Seats Bucket Seats CONNECTIVITY GROUP Tire Pressure Monitor Bluetooth Connection Auxiliary Audio Input MP3 Player *Note - For third party subscriptions or services, please contact the dealer for more information. * This 2018 Jeep Wrangler JK comes with a CARFAX Buyback Guarantee, which means you can buy with certainty. 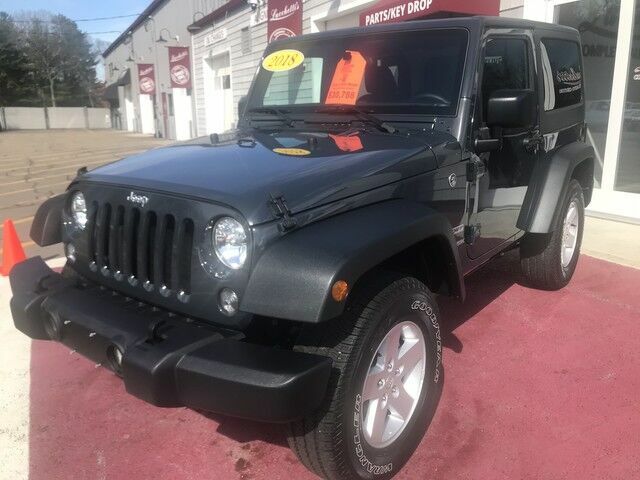 This well-maintained Jeep Wrangler JK Sport S comes complete with a CARFAX one-owner history report. We at Lucchetti's Auto Center are very meticulous. This hand-selected Certified Pre-Owned vehicle has surpassed our own standards and requirements. If you're in the market for an incredible SUV -- and value on-the-road comfort and manners more than ultimate off-road prowess or tow capacity -- you'll definitely want to check out this Jeep Wrangler JK Sport S. With 4WD, you can take this 2018 Jeep Wrangler JK to places roads don't go. It's all about the adventure and getting the most enjoyment out of your new ride. Previous service records are included, making this Jeep Wrangler JK extra special. Beautiful exterior. Clean interior. This Jeep Wrangler JK is so immaculate it is practically new. Get more for your money with this well appointed vehicle, including a factory warranty.